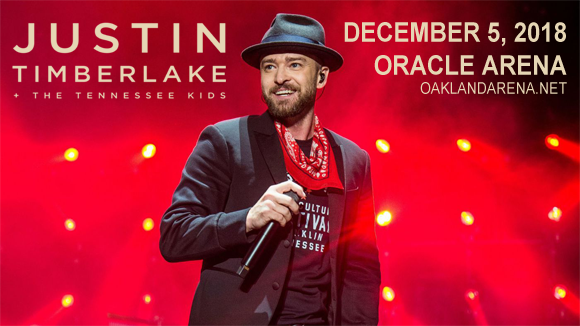 Grammy Award-winning entertainer extraordinaire Justin Timberlake is coming to Oracle Arena on Wednesday 5th December 2018 on his much shouted about Man of the Woods Tour! Backed by his phenomenally talented 15-piece band, The Tennessee Kids, he will be performing tracks from his hot new album, plus a sprinkling of Timberlake classics and maybe even a few surprises up his plaid sleeve… Tickets available now! Justin Timberlake is an American singer-songwriter, actor, dancer, and record producer who has sold over thirty two million albums and fifty six million singles globally to date, making him one of the world's best-selling artists. Timberlake started a life in show-business at a young age, coming to public attention on the television shows Star Search and The All-New Mickey Mouse Club. In the 1990s, Timberlake became a household name worldwide as part of NSYNC, a boy band that became one of the best-selling boy bands of all time. In 2002, he released Justified, his debut solo album, which debuted at number two on the Billboard 200 and launched the singles "Cry Me a River" and "Rock Your Body". The album also earned Timberlake his first two Grammy Awards. Timberlake's four subsequent solo albums brought his even greater success, with each peaking at number one on the Billboard 200. Timberlake has been the recipient of several awards throughout his career, including: ten Grammy Awards, four Emmy Awards, three Brit Awards, and nine Billboard Music Awards.